DS decided he wanted to contribute to our dinner party and what better way to contribute than by creating a luscious, rich dessert? 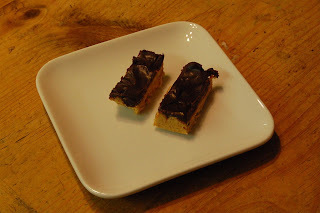 He selected a recipe for Buckeye Bars, from the latest issue of Kraft Food & Family Magazine. The recipe was simple to put together and required no baking so it was a perfect kid-friendly recipe. Oh yeah. They tasted great too! Refrigerate 2 hours. Use foil handles to lift dessert from pan before cutting to serve.